Painting has always been one of my first love. I share with you these images dear to me. I have recently made them available as limited edition prints. I hope you enjoy them. DISCLAIMER: This web page is the property of the Cham Enterprises Ltd. Any reproduction of this page in whole or part without the prior consent of Cham Enterprises Ltd is strictly prohibited under several US and foreign copyright laws. Cham Enterprises Ltd does give anyone the right to reference this document and create links to it, in order to promote education and entertainment to the online community. 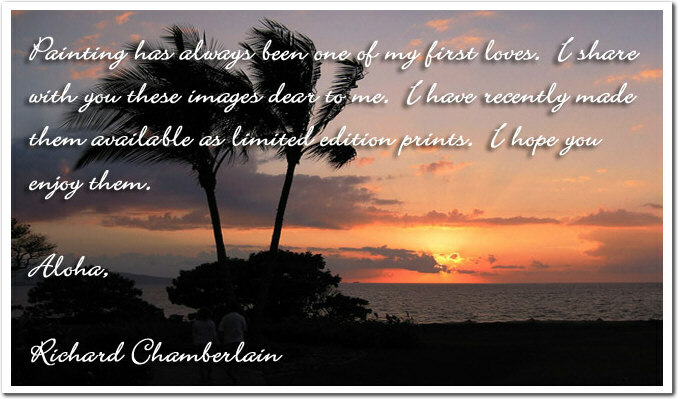 If you have any questions regarding this copyright, please contact Cham Enterprises Ltd by email at info@richard-chamberlain.com.